Club Penguin Cheats by Mimo777 Club Penguin Cheats by Mimo777: Club Penguin You Decide: Costume Item! The Club Penguin Team has been working on some new costume ideas, and they need our help! For the upcoming catalog they want you to vote on which costume you like the best. You can send in your vote HERE! Which costume are you voting for!? I think the Pizza Costume is the best. Imagine walking into the Pizza Parlor dressed like that. pizza costume so i can eat myself! The Pizza costume for sure. I think the pizza costume is the funniest and the most original. 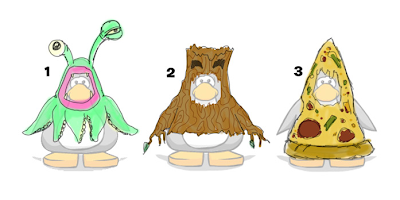 I think the pizza costume is the best because the alien costume was already done and the tree costume does not suit for penguins. The pizza costume! It's creative! I'm sure everyone would like dressing up like a pizza.